A Frechet right (or Weibull minimum) continuous random variable. 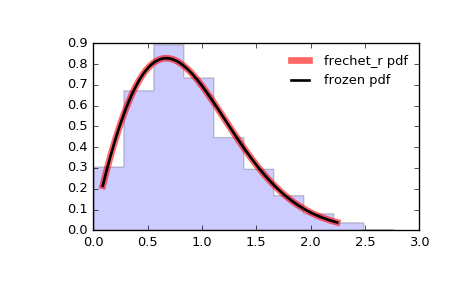 The same distribution as frechet_r. frechet_r takes c as a shape parameter. The probability density above is defined in the “standardized” form. To shift and/or scale the distribution use the loc and scale parameters. Specifically, frechet_r.pdf(x, c, loc, scale) is identically equivalent to frechet_r.pdf(y, c) / scale with y = (x - loc) / scale.